So, yesterday while I was lathering up with some irish Spring in the ol' shower Jamie announced that she had lost her engagement ring. 1. Taking her rings on and off or switching them around on her fingers. 2. Using copious amounts of hand lotion to fight off the debilitating desert air. I'd pretty much decided about 5 years ago Jamie would lose her rings at some point, and so when she announced she'd lost the ring I don't think I displayed the proper panic. I did finish my shower, comb my hair and put on some undies in hopes of assisting, but was, instead, shoo'd out the door. Still, while I knew I was now going to have to save up to buy an all new engagement ring, I still don't think I ever really went overboard about the whole incident. That, and it wasn't one of Jamie's two daily activities that had led to the whole debacle. Apparently she'd taken off her rings to eat ribs, and we'd gone to the ribs place because I like to go there and watch basketball on their giant TV. So Jamie was humoring me just by being there. The ring, itself, is a copy of a family heirloom and actually has the diamonds FROM the family heirloom embedded in it. So, you know, you're really not supposed to lose completely irraplaceable family jewelry. And buying a new ring would have been a nice thing to do, but it wouldn't have resolved that issue. Anyhoo, 9:30 last night they called and someone found the ring at Damon's. Hooray! Tonight we're stapling the ring to Jamie's finger. This lady is really, really smart. Do you know why I get to say this? Because I worked at the Disney Store for three summers and 1 summer at Chuck E. Cheese. There's something about having kids under the age of 5 that makes some people convinced that Satan himself is trying to somehow corrupt your kid. 9 out of 10 times, it's nothing the kid would have ever noticed if the parent hadn't misinterpreted it and then made a big deal out of it. I usually would humor these angry guests for a minute and then point out a manager. If a manager wasn't readily available, I would ask "Was your child upset by this?" which was probably not what Disney wanted me to do, but I figured I could probably find another $5.00/ hr job if push came to shove. Without fail, the child now only knew that the Disney Store was now suddenly a "bad" place full of wicked $5.00/ hr clock watchers but wasn't sure what the hubbub was really about. Look, there is SOME stuff in Disney movies that shouldn't probably be there. The priest's erection in Little Mermaid comes to mind. That's no urban myth. The supposed one frame of Jessica Rabbit I've also seen confirmed. However... That stuff is fairly well hidden. If the two frames of filth have forever warped your child, you're a terrible parent and you're doing an awful job of preparing your kid for life. These are not the messages you get to relay when you don the polyester sweater and form fitting pants. If the 1/24th of second of obscenity is bugging you that much, Disney has a policy that you can, at any time, return any Disney product to a Disney Store and receive some sort of refund. I am sure by offering up this info that I just broke a non-disclosure agreement, but it's true. If Mickey or Goofy are on the item, you can drop it there and get some sort of reimbursement. The flipside of this is, of course, that for every one of these parents who is trying to shelter their kids from the storm, there's 5 of the "throw 'em in the deep end" variety dropping the f-bomb because they can't find the right size princess dress for their kid. The League is not wholly convinced that these parents aren't usually one and the same. It all sort of depends on their mood and who they want to blame today that their kid is a little hooligan. -If Elmo's weird little friend's garbled squeakings sound to you like "Who wants to die?" let's think of it as a Rorshach test, mommy. Maybe it's time for you to take a look around the house and see what needs changing. -If Elmo's weird little friend is, in fact, asking "Who wants to die? ", you gotta look at the bright side. Maybe your kid is just learning about goth kids at an early age. -Finally, if you're reading your kid an electronic talking book about how to take a pee, The League would suggest you need to sit back and take a good, long, hard assessment of your life. Look, if you want to be concerned about your kids learning how human beings are, I highly suggest locking them in a box until they're 18. Then let them out. As an adult with adult experiences, you may read all kinds of stuff into works which were never intended to be all that filthy. Further, calling CNN because there's bad audio in your Elmo read-a-long book is a cry for help. Sometimes bad audio compression is just bad audio compression. And that's the advice today from Uncle League. A) Hey, look! It's Carla Beth! Carla was my roommate in college and a collaborator throughout film school. She's a peach of a girl, now living in North Carolina, and she's got her own blog. For those of you wondering what Carla is up to, check it out. B) I've posted an opinion on the Disney/ Pixar deal at Nanostalgia.com. C) For a whole, wide array of Toys That Should Not Be, go here. D) "Flava of Love" makes me weep for the Public Enemy of my youth. Yet I cannot look away. E) I feel like I need a fifth item, but I can't think of one. Uhm. The new sandwich place I tried the other day promised my sandwich came with fries. What they did not say was that the fries were IN the sandwich. That was not good. 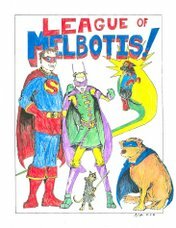 Ah, it wouldn't be The League of Melbotis if we weren't supporting anti-social and possibly dangerous behavior. You'll note that The League doesn't hesitate to post little blurbs here and there along the way about folks in costume trying to get things done. Grant Morrison called it, saying we'd start to see superheroes in the next few years. And I think we will. I don't think they're going to look a lot like Superman or Green Lantern (and I guarantee you, no Wonder Woman), but I do think people are going to put on masks and leap into action. I just hope it looks more like this and less like this. And this brings us to the real-life case of real-life superheroes Mr. Silent and Doktor DiscorD. The comic blog-o-sphere has been ablaze of late chatting about the duo (calling themselves the Justice League of Justice) and their unsolicited attempts to clean up the streets of Indianapolis. 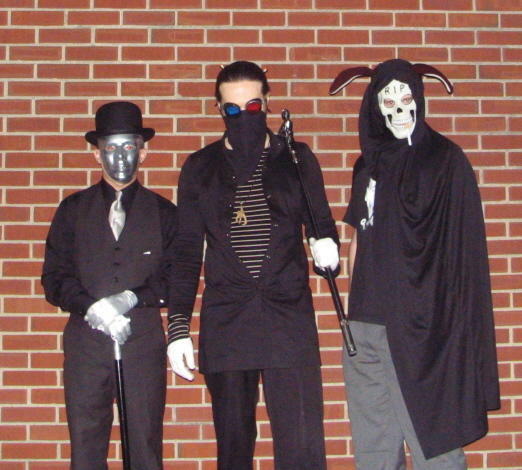 Mr. Silent, Doktor DiscorD and, I believe, "Doom Bunny"
Now, a lot of that chat has been about how these two guys are probably going to end up getting killed. I hope not. The League thinks we're in the 21st Century, and Real-Life superheroes are an idea whose time has come. We more or less already have supervillains (Bin Laden. Kim Jong Il. Kevin Federline. ), and nobody to thwart them. Well, we have Condoleeza Rice, but that's the worst superhero name ever. It sounds less like a menacing avenger of justice and more like an undiscovered (but delicious!) version of the San Francisco Treat. And if you think that here in the U.S. of A. that we don't have nutjobs in costumes running around in masks who could use a good beat-down, I submit this. Read an interview with Mr. Silent here and Doktor DiscorD here. And I guess this whole thing started over with Warren Ellis here. Can we expect to see Supervillains? Well, Superman didn't come out of the gate fighting supervillains, and neither did Batman. The supervillains came along later. Hopefully, all of this will go better than Jim D's ill-fated journey into costumed vigilantism. Oh, Leaguers. The Suns almost went into triple overtime again this evening, but Allen from the Sonics hit a 3-pointer with only 1.5 seconds left. Nerves of steel on that guy. Anyway, one of the highest scoring games in NBA history.152-149. Yowza. I watched most of the Seahawks-Panthers game. I was cheering for the Seahawks, but mostly because I was cheering for Mike Holmgren. And I cheer for Mike Holmgren because I look at the man and I know what I'll look like in 15 years. I also like Shaun Alexander, but how can you not be impressed with that guy even if you're not a fan? Jamie's brother went to high school with Mike Minter on the Panthers, so we need to cheer for him, if not the whole team. Editor's note: Jamie says "I went to high school with him, too - he was two years ahead of me and one behind Doug." I really didn't care who won the Steelers/ Broncos game, except that I sort of admire Jake Plummer's whole "I really need professional help, but as long as I can throw a ball they give me money" thing. I hope to have all of my insanity forgiven one day because I have some money-making skill. Hey, who ever filled the void left by Wesley Willis, anyway? I'm still coming down from a busy week of work. In FACT I was at work today for a while. Technical support doesn't just go on M-F, 8-5, occasionally on Sundays people expect service, too. This week may be full of wonder and surprises. If what I think may happen occurs, you people will be the first to know.. Happy Birthday to Reed T. Shaw! Reed is now old and reportedly has a kid. Sure, he's keeping her in an igloo cooler with an iguana named "Rex" and feeding her only fish food, so I'm not sure what kind of father he is, but he's no longer care-free twenty-ish Reed T. Shaw. 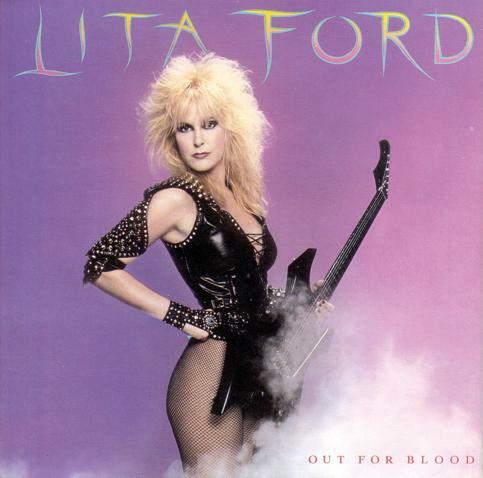 In honor of Reed-O's birthday and to commemorate Reed's glory days, I provide us with the cover image of Lita Ford's 1983 album, "Out for Blood".